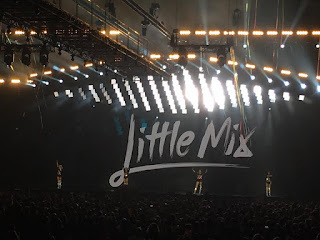 On Saturday I went to see Little Mix live for the second time with my family as it was my mum’s birthday (and two days after mine!). Yes, by ‘with my family’ I mean even my dad came, and let’s be honest I think he quite enjoyed it. The first time I saw Little Mix was in April last year and it was honestly one of the best shows I’ve ever been to, and I have to admit I was a little worried about how this year’s concert would match up to that one since it was so amazing. Nevertheless, I was proved wrong when I thought that they couldn’t possibly put on a show as mind-blowing as last year’s. We arrived at the arena at about 7:30, and this was actually perfect timing because we didn’t bother to watch the support act (oops) and not long after we went in to take our seats. This was a fabulous idea because we didn’t have to wait ages for Little Mix to come on, and usually the part I hate the most is sitting through boring support acts and waiting for hours for the main event. One of the most legendary things that happened was just before Little Mix came on stage. Beyoncé’s ‘Run the World’ came on really loud – that’s when you know the show is about to start, by the way – and this random woman from the audience just decided to start dancing around the entire arena! It was literally one of the most hilarious things I’d ever seen – she went down the aisle and down to the floor, dancing along and getting the entire crowd clapping along with her before running up and down the stairs between the blocks! 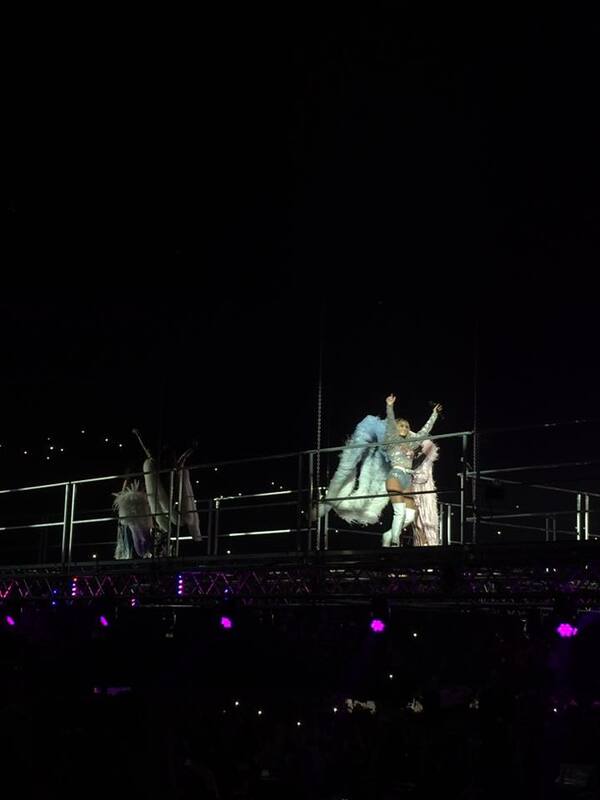 I’m not exaggerating when I say that the ENTIRE arena turned around to watch her, I was in one of the back blocks and everyone on the floor was turned to the back to watch her – loads of people snapchatting, singing along and laughing. Honestly I have never seen anything like it! It really got everyone hyped and even though we were all thinking ‘what on Earth is she doing? !’, it was a great way to warm up the crowd before the show. So whoever you are random woman, thanks for bringing some extra entertainment to my Saturday night, it really took some balls to do that. Straight after that surreal performance, the lights dimmed and the show started. ‘Power’ was the perfect choice for an opening song as it’s so energetic and really got the crowd hyped up – even more than they were already. The upbeat tone continued as they sang ‘Black Magic’, ‘Move’ and ‘Private Show’. That’s the thing I love about Little Mix, their energy on stage is infectious and it gets the whole crowd on their feet, screaming the lyrics and dancing like they don’t have a care in the world. It made me so happy to see the tiny little girl next to me having the time of her life and getting so into it. Another thing that amazed me was that Jade had a throat infection yet she still managed to try to sing the best she could – she’d start off the notes (still sounding better than I ever could) and get the crowd to sing her parts for her. Yet, she still did the entire show with a smile on her face and tried so hard to sing when she could, and I respect and admire her so much for that. You could see in between songs that she was struggling but the fact that she still put all her energy into the performance; they all got the choreography perfect, she sang as much as she possibly could and still interacted with the crowd – and that’s what makes a true performer. So much respect to her for the absolutely amazing performance she gave despite barely having a voice, you go girl! 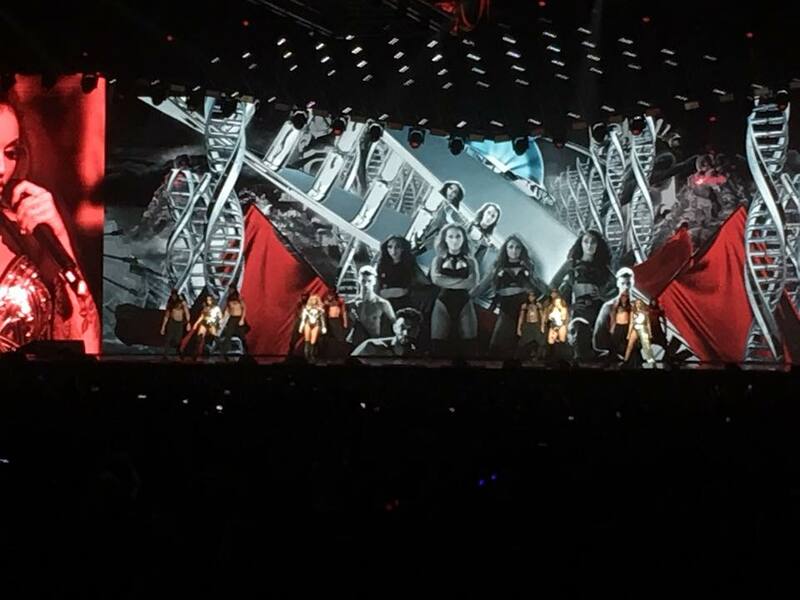 What I love about Little Mix’s shows is that they always tell a story and have amazing staging to go along with their performances. While they went off stage for a concert change, a video played of them in their dressing room dancing to ‘Reggaeton Lento’ (one of my absolute fave songs at the moment), which was such a fun interlude before they came back out and sang ‘No More Sad Songs’. During ‘Your Love’, a bridge started coming down from the ceiling, across the whole of the floor of the arena and there was also a walkway that came down right in front of our block! They started walking across it towards the end of the song and talked to the crowd while they were standing literally metres in front of us, which was really cool. Like, super cool. It also allowed me to get some photos where you can actually make out their features rather than them being blobs on the stage! They introduced the next song ‘Secret Love Song’ by dedicating it to all their fans, and especially to their LGBT fans because they said they’ve heard how it has helped them a lot. I thought this was a really sweet thing to do, and the song was so beautiful sung right in front of us. When they perform a stripped down song like that, it shows off their vocals so well and really proves just what incredible singers they really are. It made me quite jealous – I mean they’re all beautiful, lovely people AND they can sing and dance?! Unfair. But incredibly enjoyable to watch, so I’ll forgive them. They also sang ‘Nothing Else Matters’ along to a sea of flashlights before leaving the bridge behind and going back onto the main stage to sing an absolutely iconic classic Little Mix song ‘Wings’, which I must admit got me extremely hyped – I was dancing around probably even more enthusiastically than the little girl beside me who was probably about a quarter of my age! The next part of the show was probably one of my favourites. There was another video interlude, but this time it was just a black screen with white writing scrolling across it, and a voice reading out the words as they ran along the screen. The phrase ‘What am I?’ would be followed with ‘I am powerful’, ‘I am brave’, ‘I am a lover’, and other adjectives followed by an inspirational explanation as to how to live out those assets. I adored it, and I have to admit it did make me tear up because I related to it so much and it was so empowering. It ended with ‘I am a Queen’, and went on to say that a Queen doesn’t need a King and can rule on her own. I thought the whole thing was an amazing message to all Little Mix’s fans, especially all the really tiny little girls I saw around me, and it warmed my heart that they were being given such a powerful and important message from their idols. 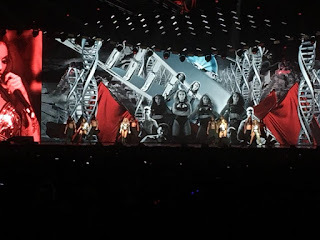 The final quote was ‘and I salute all Queens’, and the girls appeared on the stage again to sing ‘Salute’, one of my ultimate favourite songs probably ever. I just adore it because it’s so empowering and makes me feel like I can literally conquer the world, as cheesy as it sounds. This section, as I’ve said, was one of the highlights of the show for me because they sang four uplifting, energetic songs after one another – ‘Salute’, ‘Down & Dirty’, ‘DNA’ and ‘Freak’ – without even stopping for a break. For me, who can’t even climb two flights of stairs without being out of breath, I was just in awe of how they did all that choreography (which by the way was mind-blowingly awesome), sang perfectly and kept up their energy for four whole, upbeat songs. It certainly made the crowd go wild and I thoroughly enjoyed this super energetic section of the show. After this, they played a bit of a game with the crowd, which was also one of the best parts of the show purely because of how entertaining it was. Each of the girls picked a song to ‘test’ the crowd’s Little Mix lyrics knowledge and pick a ‘fifth member’ of the band. They’d start off by singing part of one of their older songs, and get the crowd to sing the next line, kind of like what they do on Ant and Dec sometimes. Anyway, it was so much fun and the camera panned around while everyone was singing and zoomed in on certain people, and it was hilarious to see their reactions. If you’ve read any of my previous posts, you’ll know how much I love some good audience interaction, so this was a big fat tick in that box. Another thing I adore about Little Mix is how down-to-earth they are, they literally just talk to the crowd as though they’re a friend and I love when artists aren’t afraid to do that. The game ended with Jesy picking a winner, but actually she picked two winners and invited them up on stage to sing with them. They were two guys, probably in their 30’s, and it was just hilarious to see how much their faces lit up when they got to hug the girls and sing ‘Touch’ with them. They were actually pretty good singers, to be fair! Jesy kept going on about how sweaty she was when they hugged them as well, it was so funny. They then went on to sing ‘Touch’ properly, mixed at the end as a kind of mash-up with ‘Reggaeton Lento’ which I adored because they’re two of my favourite songs. After this, they went off stage and a video played telling us to ‘clap your hands’, ‘stamp your feet’, and ‘chant Little Mix’. I thought this was such a great and original idea, I’d never seen it done before and I thought it was clever because sometimes when you’re waiting for the encore people don’t really know what to do and don’t make enough noise, but this got us all hyped up and loud for them to come back and do the encore, ‘Shout Out to My Ex’. This was a fantastic song choice for the last song because it’s such an iconic song and it left everyone on such a high as the glitter confetti fell down from the ceiling. As I said at the start, I really wasn’t sure how Little Mix could top last year’s tour, but I think they might have done just that. Their vocals were on point (even Jade with a throat infection), their energy was just on another level, their choreography was perfect and the staging and outfits were incredible. Little Mix never fail to put on an amazing, enjoyable and empowering show that makes you forget about your worries, let you dance like there’s no tomorrow and leave you feeling like you can do anything you want to do. Have you seen Little Mix live, or are you seeing them on the remaining dates of the ‘Glory Days’ Tour? Let me know what you think in the comments, I love hearing from you!